Every year, the country’s financial capital is paralysed as roads and rail tracks get submerged whenever it receives heavy rains during the monsoon, raising questions over the civic body Brihanmumbai Municipal Corporation’s preparedness. It has now become an annual affair. Monsoon rains mean flooding of Mumbai and troubles for the public. 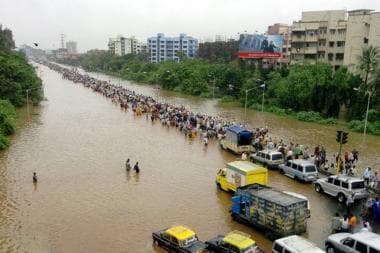 Every year, the country’s financial capital is paralysed as roads and rail tracks get submerged whenever it receives heavy rains during the monsoon, raising questions over the civic body Brihanmumbai Municipal Corporation’s preparedness. A similar thing happened during the last two days even after the civic body’s claims of spending thousands of crores to rid the city of the recurring problem. News18 got hold of corporation chief Ajoy Mehta and asked him the questions that the city wants answers to. Q. The British built south Bombay’s drainage system and it still works. Why have we failed on this front despite spending hundreds of thousands of crores? Why was Mumbai not monsoon ready? A. You must understand that the population during the British regime was scantier. From 1981 to 1991, we saw a population growth of 38 percent. And up until today, you are seeing unprecedented population growth in Mumbai. The density of population has been the highest ever. You have 12.4 million people living in 476 sq km. Of the land we have in Mumbai, 30-35 percent is can’t be developed. Now, compound these figures with construction, housing and office space that become inevitable in the financial capital. The climate change has been noticeable. These are challenges we face on back of an over populated, fast paced city that’s always on the move.Migration of population in this city has also been unprecedented. The corporation faces tough challenges to work normally because of all these factors. Despite that we have done our level best to ensure we do what is required.Q. What was your plan of action to make Mumbai monsoon ready? Mumbaikars are unhappy with the authorities and the Shiv Sena. A. Look, in 20 days itself we received 67 percent of total rainfall that Mumbai usually receives in the entire season. And the anomaly here is that lakes are still empty. The rainfall this year was not evenly spread. We addressed 250 flooding spots and tackled them. A total of 105 locations were also tackled. Our main challenges pre-monsoon were utilities, traffic and encroachment. Despite that we did the best we could. And I am not getting defensive. You ask me anything and I will answer.Mumbai is a very challenging city. We can’t just block roads etc as the congestion will increase. The metro work is going on and it must go on. Roads are already partly blocked due to that. We can’t block more. Civilian life pre-monsoon would have been disrupted. We have to take stock of all of this.Q. How would you explain what Mumbai needs and what are you doing about it? Train schedules were disrupted and roads were jammed due to rain. A. Yes, I agree train schedules were disrupted when the showers were heavy. They were slow, but were running. There are localised issues like roots of trees that run deep and we can’t shake the foundation of the trees either and some of the work takes a hit as we don’t want to uproot any trees. There is a need for an increased subsidiary holding capacity and we are working on it. We have started making rooftop gardens. There is compulsory green space allocation ordered. Q. Potholes have claimed lives in Mumbai. Doesn’t it bother you? A. There was a scam in road building that was unearthed. Yes, we had scams. We blacklisted contractors. Two chief engineers were arrested. Quality assurances inspectors were found guilty and jailed. We tried them for criminal liability and not civic liability. We have changed the tender conditions now and broken the corrupt nexus that existed. We changed the design parameters. We changed the execution methodology. We have a list of roads that are free of potholes. I’m giving it to you and you can go and check them yourself. The western express highway does not fall under the BMC jurisdiction. It falls under MMRDA. The by-lanes are under PWD jurisdiction. The ones that fall under BMC are more or less addressed despite the impediments I just explained. Of the total 2,000 km stretch of roads, 500 km are always dug up for utilities and that’s inevitable. The post trenching integrity of roads was compromised and we have reinstated the trenches. Q. But the quality of the pothole repairs was not up to the mark. Would you agree? A. My engineers have been careless, I admit. We have gone wrong at some places. The quality of work carried out by the contractors was not okay. We went wrong in the choice of roads at certain locations too. We are now upping the quality of roads that are getting spoilt due to constant erosion. For instance, sharp turns. We are working on bringing uniformity in manholes of utility. We have documented why the potholes developed in the first place. Compared to the year gone by, I can prove how conditions of potholes on roads under BMC jurisdiction have improved. Q. What do you have to say about the Shiv Sena which is at the helm of affairs at the BMC? Q. We often see the buck being passed from MHADA to MMRDA to PWD to BMC in no particular order. Would centralisation help? A. See the MHADA and MMRDA are highly specialised agencies. The coordination problems are very complex. There is a mismatch of timings of priorities. Plus the metro construction now is inevitable but once done, it will solve many traffic issues in the city. I don’t think a centralised agency is the answer. Q. Bridges are collapsing, I have myself seen the cracks on the Grant Road railway bridge and the Kemps Corner Bridge even has a hole from where the water is leaking on the streets and has a few visible cracks. What is the BMC doing about many more such flyovers and bridges? A. I have ordered an audit. We are analysing the complete report at this point of time. There is an action plan and you will see. I have put systems in place to resolve the issue. Q. You are the richest civic body in Asia. Where has the money gone? A. We have utilised it for all the work I just mentioned. And yes, the funds have not been utilised properly. We can’t work in the day as the traffic will increase and add 50% more to the travel time. In the night the citizens get disturbed if there’s repair work going on. This city is complex and the issues are not straightforward. We have followed guidelines on appointing for tenders in contractor appointment. Q. CCTVs were installed after the terror attack. Is the mechanism being used for traffic control too? A. Yes. We have managed to install 5,400 CCTVs across Mumbai and the control room is manned 247 and is extremely active. The city is over congested. Understand that. Q. Did you have a meeting with all stakeholders pre-monsoon? What did you do about the footpath encroachment? A. Yes, it was done in November. We identified issues and resolved them despite multiple impediments. Mumbai is undergoing continuous changes. Too many people migrating here over crowding the city. It’s a very aspirational city and that needs us to improve continuously. We are working to create footpaths. The metro construction is on and hence it is all slower than usual. There is also a humanitarian side of things. We can’t just evict people working on the streets and make them jobless. We need to make sure they are not affected by that. Understand we have to be extremely sensitive towards them. We are now creating a 42-km-long cycling stretch. Q. Why can’t we have a dedicated emergency lane in Mumbai for ambulances, fire brigades and police? People don’t make it to hospitals in time due to traffic and lives are lost. A. Firstly, it is a great idea on paper. But tell me how can we block roads and get horizontal space from? It will create havoc with the traffic on streets. There are space constraints too. Also what is the real dipstick of what people want? A referendum? A TV debate? You tell me. If they say they want this dedicated lane, it comes with challenges and disruptions. If they don’t want those disruption then we can’t create the lane. I want to know from the people of Mumbai if they want this. Let there be an open debate on this matter. Q. Is the city crumbling? A. No. I will not let it crumble. I’m a Mumbaikar just like you are, but you see I explained what the challenges and practical impediments are. I want to retire in Mumbai. I won’t let this city collapse ever till I’m the BMC commissioner. I’m a Mumbaikar first and I’m not defensive at all. I’m stating facts as they are and willing to answer every question honestly.